My Mom’s famous caramel brownies are a huge tradition around here. You only need 5 ingredients and you’ve got yourself the most delicious brownies ever! Can Chocolate Cake Mix Make Brownies? If you haven’t tried this trick you’ve been missing out!!! HECK YES!!!! In fact, chocolate cake mix allows you to make brownies without eggs! All you need is butter, melted of course, and evaporated milk! Double wrap the brownies in foil and then plastic wrap, or put in ziplock freezer bag and freeze for up to 4 months. Let’s talk brownies. And first fights. 🙂 Yeah, this is going to be a good post. 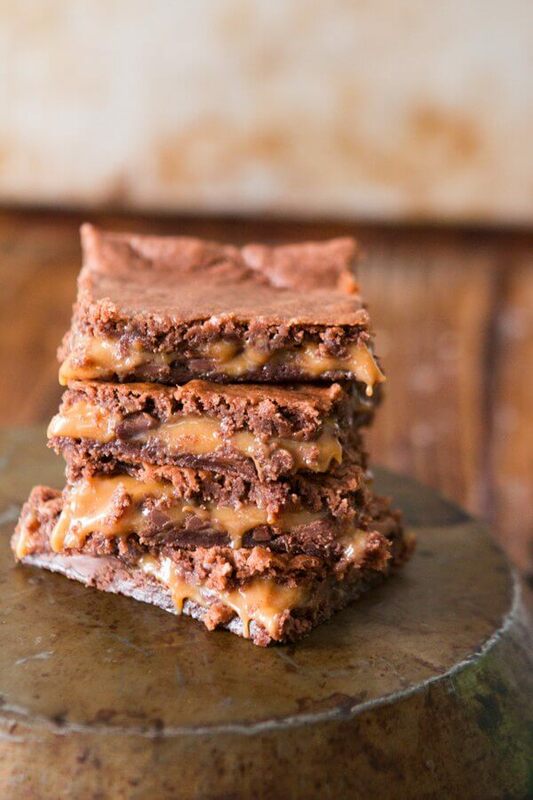 My mom has made these caramel brownies since the beginning of time. Pretty much all of us kids would request them for our birthday treat instead of cake and every fourth of July this was what Mom brought to the Elmer’s pool party. Us kids would swim all day, almost always in the rain because hello, it was Washington, and the adults would sit around chatting until dark. I don’t even remember talking to my parents all day. It must have been a dream, all day with your best friends, delicious food, and kids totally entertaining themselves. Everyone couldn’t wait to get their hands on Mom’s caramel brownies. She’s known for them, they are that good. But let’s get to the fight, although it really wasn’t that, more just our first moment. We were engaged and it was Cade’s 24th birthday, his golden birthday. I decided to make the famous caramel brownies and surprise him. I left them on his kitchen counter with a note and didn’t go into his apartment again for 2 days. Just busy with school and we hung out on campus or my apartment. Well when I walked in, there was the whole pan. Not a single one gone. Cade was all about health and fitness and had no desire to eat sugar so he didn’t. What? I thought for sure his birthday would be a great reason to have something yummy and they were Mom’s famous caramel brownies! (Actually I think the recipe came from Peggy Glem originally) So in typical girl fashion, I had hurt feelings and told him so. He ate one. And it has been his favorite dessert ever since. My mom even occasionally sends him a package of them in the mail because she knows they are his guilty pleasure. A first fight, over brownies. So what’s the secret? Well we break my favorite rule for this one, butter for everything. Instead we use margarine and look, I don’t know why but I really do prefer it. They stay gooey and yet hold up to the filling unlike other brownies and ingredients. We also only use German chocolate Cake mix from Betty Crocker. It’s a must. Anything else just doesn’t turn out the same. And the topping? Well I prefer to scoop a little into my palm, press it flat and patch work it onto the brownies, but my brother invented the saran wrap method. Just stretch saran on the counter, press the topping out flat into the size of the pan and invert it onto the brownies. I did that for these photos because it is the easier method which means 99% of you will do it, but I like the patchwork because it gives more height to the brownies. Oh, and only Kraft caramels and evaporated milk. The end. Now go make the heck out of these and leave lots of love so my mom feels special. Insert a toothpick in the center of the pan. If it comes out clean, they are done. Sometimes you want a gooey brownie, but not under-cooked. The best method to determine doneness in this case is to watch for the brownies to slightly pull away from the edge of the pan. Then check to see if they are “set” in the middle. They should not wiggle when you gently shake the pan. How do You Store Brownies? Store in an airtight container or double wrap in foil. Spray a 9×13″ pan with nonstick spray. In a bowl, mix the dry cake mix with the milk and margarine. Pour 1/2 the batter into the pan and gently spread it out. It will be very thin. Place remaining batter in the fridge. Meanwhile, unwrap the caramels into a glass bowl and add 1/3 cup evaporated milk. Microwave on high for 30 second intervals, stirring between until smooth. Remove the brownies from the oven and sprinkle with chocolate chips. Pour the caramel over the chocolate. Remove the batter from the fridge and gently pat a tablespoon or so into the palm of your hand. If it sticks run your hands under cool water or spray with a little nonstick spray. Place each piece over the caramel like a patchwork quilt until all of the caramel is covered. You can also place saran wrap next to the pan and press the dough onto that in the exact size of the pan. Just measure by doing the length and then moving the pan to the end to measure the width. Carefully flip it onto the caramel. Bake an additional 16 minutes. Remove from the oven all allow to cool before serving. You can also place in the fridge to help the caramel really set up which makes for easier serving. Pingback: 12 Brownie Recipes: For you Sweet Tooth! Welcome Sheila!! I guarantee you and your husband are going to love these! You have a great weekend too! You said that the batter should be very thin and to pour it in the pain. My batter is the complete opposite, like cookie dough. What went wrong?? I did the cake mix, evaporated milk and the margarine. HELP!!! Was I also suppose to include the cake box ingredients???? It sounds like you did it perfectly! It should be like cookie dough. Since you only use half the batter on the bottom, that layer will be very thin. Then you put the other half of the batter on top of the caramel layer. Enjoy!! 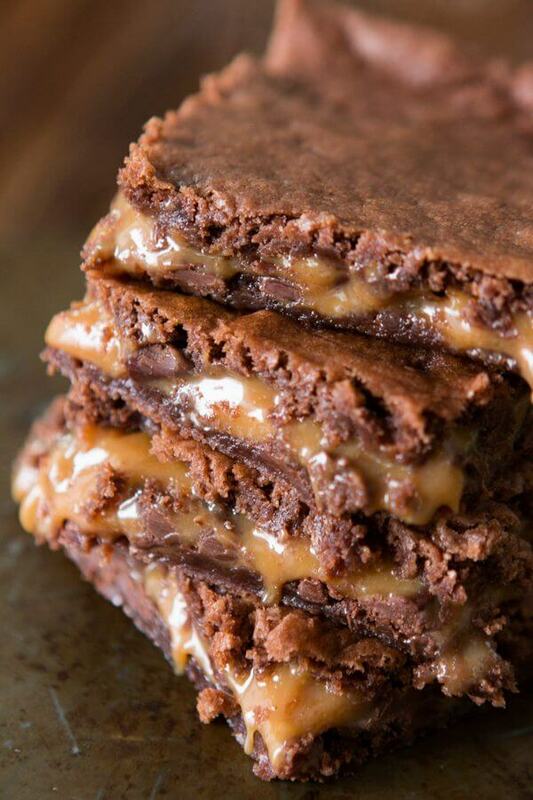 For the caramel brownie recipe can I use dulce de leche instead? If yes do I need to had the milk with it? 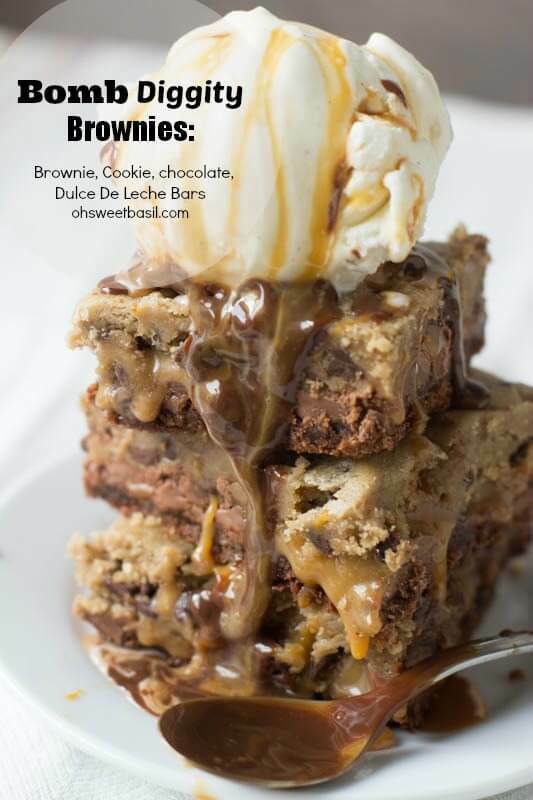 You can, but it will melt into the brownies a little more as they bake up differently but both are so good! Oh my gosh we love these brownies. Probably made these for 40 + years at Christmas time. We put nuts in them. Yes, I’ve seen them with nuts! Have not made these brownies for ages but they are so good!! Great recipe, thanks for the reminder. Hi, these sound amazing! Do you know what size bag the caramels is? Maybe about how many caramels are in the bag (long shot here but I gotta try..)?! I made homemade caramels for Christmas and I’d like to use the rest up and make these. Thank you! Am I reading it right that there are no eggs? Does that make them more flat and chewy? I hope so ツ I actually read the recipe in the cookbook and wanted to verify on your website that it wasn’t a misprint. I want to try to create some brownies I had at Great Harvest bread too that just had a layer of milk chocolate toffees on top. Mmmmmmm!!! Brownies!!! That’s correct! More chewy than cake like which is my favorite. 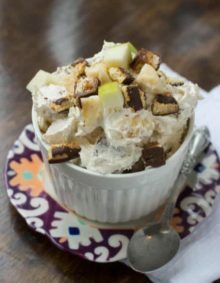 You can actually go a whole 1/2 cup less in sugar and they will be even more chew and delicious too! 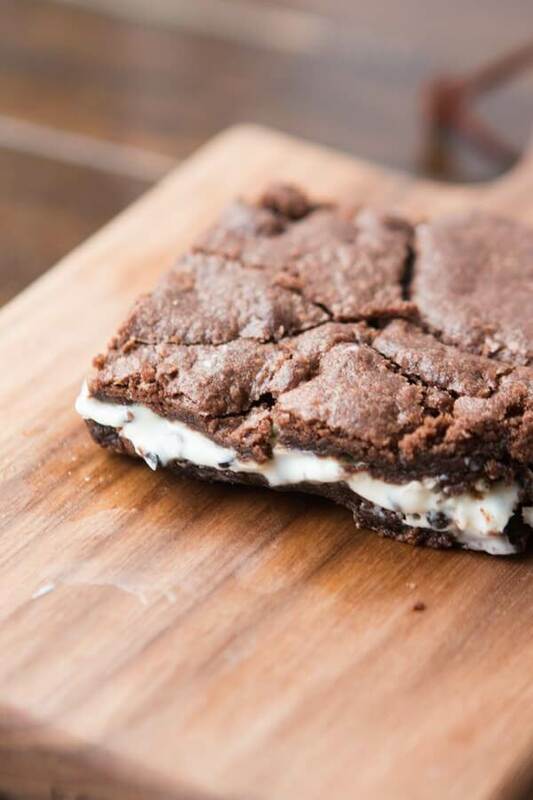 I love great harvest, so I totally need to go try that brownie! It is a bakery/restaurant chain here that makes all sorts of yummy breads and desserts. Most of the store fronts also serve breakfast and lunch too. I think they are only in Utah and surrounding states. 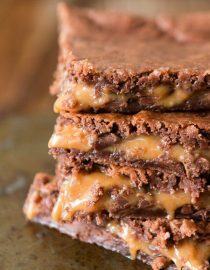 Can I use regular brownie mix or does the german chocolate cake work better with the caramel? Thanks! We really do think the cake mix is much better than using the brownie mix. It turns out different. 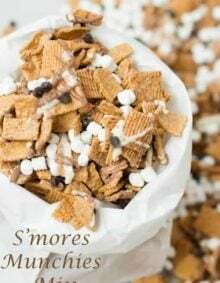 I have not tried this Recipe although I will soon!!! I just wanted to let you know how well I liked your thorough description of things and that the specific type of cake mix brand makes a difference! Well thank you! I was wondering if it would be annoying so that means a lot. xoxo! I make a similar version that has an additional ingredient of pecans mixed into the brownie layers. I will use this version when nuts must be avoided. Thanks Holly! I’ve heard a lot of people add walnuts too. 07/04/2016 Hopefully this will not bust your bubble. 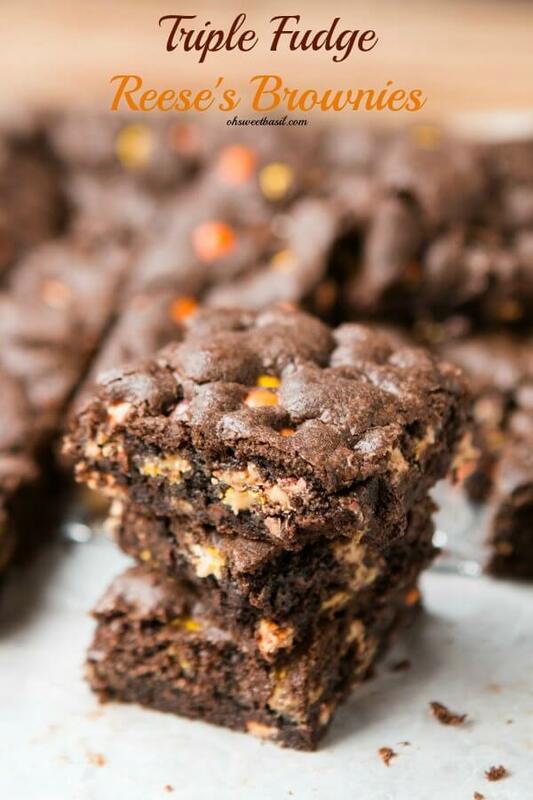 I made these brownies for years and became known for making them as a special treat. 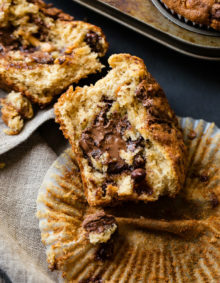 The recipe was found on the Nestle Chocolate Chip bag . The original baker must have worked for Nestle ? They are just the best brownies ever. These days there are copy cat mixes trying to steal the original recipi’s thunder. There’s nothing I love more than the combination of chocolate and caramel! These are perfect. 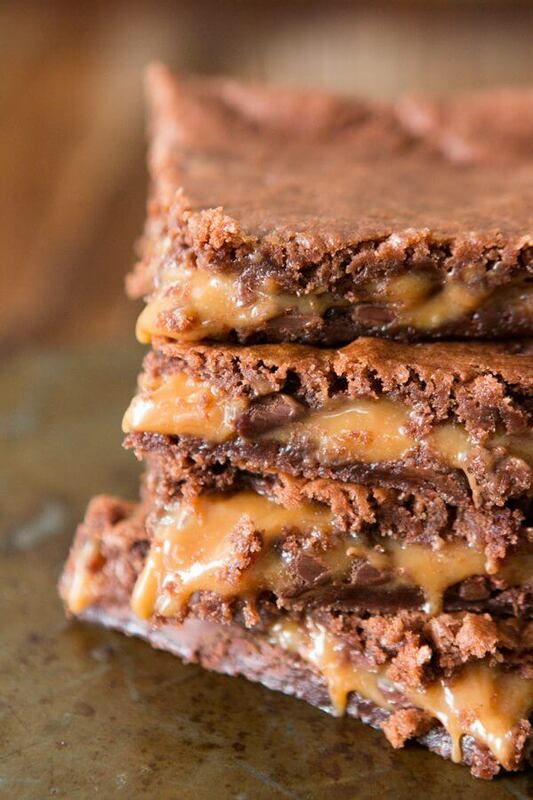 omg that gooey caramel layer! No wonder Mom was famous for these! They look absolutely divine. I can’t wait to give them a try! So easy to make which is nice! Thank you for commenting! My son is 23 yo – these are also his favorite! I made these just 3 nights ago. Delicious! I love to hear that! They are seriously such a staple and always a crowd pleaser!